The contest, created by WindCheck Contributing Editor Joe Cooper, was introduced to the popular overnighter with the intention of engaging youth sailors (ages 14-20) by asking them to answer the question, “What do you like most about offshore/overnight sailing?” through a video essay or documentary no longer than five minutes in length. Team Odyssey also won the event’s separately scored Youth Challenge (to qualify, more than 40% of the crew had reached their 14th birthday but not turned 20 prior to August 15), finishing sixth in the 13-boat PHRF class. 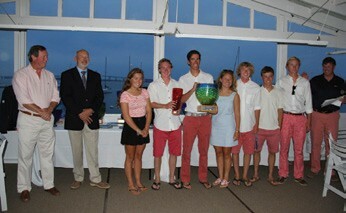 All classes sailed a 150-mile race that started and finished in Newport, RI. Hosted by Ida Lewis Yacht Club, the race celebrated its 10th edition in 2014 with a record 47-boat fleet.